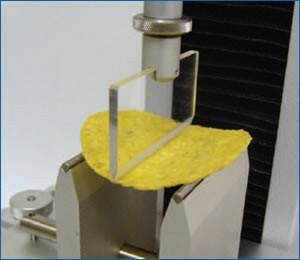 The crispness characteristics of kettle cooked potato chips were evaluated using a three point bend assembly as an indicator of frying profile. A potato chip processor wanted to have an objective measurement to supplement and confirm the subjective data they have from sensory testing. Nine different samples were evaluated. The results generate would be used to monitor processing procedures, improve the consistency of the product,objectively measure inconsistencies, and give indicators of frying method in order to maintain an ideal process. The potato chip sample is supported at two points. The travelling beam moves down and snaps the sample. Due to the inherent variation of the product, several methods were tried before determining that the snap or three-point bend would produce the most repeatable results. This test causes the chips to break in half at the weakest point; typically along the contact area of the upper fulcrum of the fixture. The small and light Perspex knife edge, which is part of the mini vice kit and general probe kit, was used for this test.